You are hired! 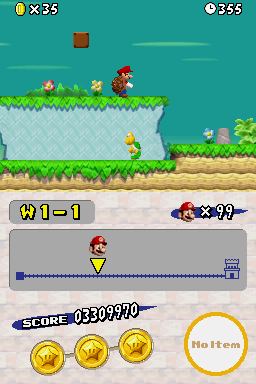 Once the hack is finished, I will send you a rom and you can play the whole game and spot any issues I have missed. 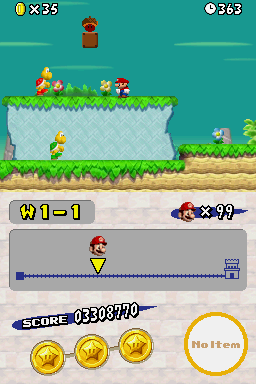 I will ask NDYmario if he would test the MvL levels I made. Yup. Gotta have an airship level. Working on a snailcorn level! One piece at a time! I didn't want to do it, but I did it. Today, I completely redone 1-1, so it would be up to quality standards. If any of you played the demo, then you know how crappy 1-1 was. parts of 1-2 and 1-3 along with 1-4 are also going to get some touch ups. Anyways, here is another image leak. This looks like a great hack so far! 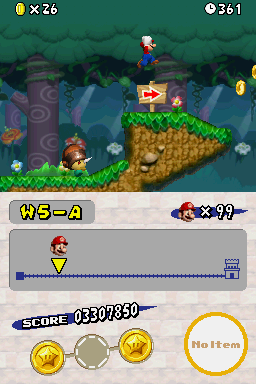 But I'm wondering, are you going to be porting levels from NSMBU? Even if you had to modify them a little, I would still be happy if you do that. Like I said in the thread, this is NOT a remake. 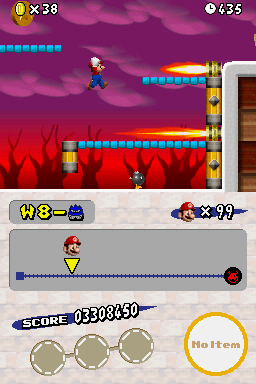 It would be impossible to keep some levels significant. I thought I'd post an update, and there's no images here, but something even more exciting. This is official. There's going to be a customized Power up in NSMBU DS. I thought of it myself. It will use the code of the Blueshell, as well as a retextured model. Will post an update soon. There you go. Still in Beta stages. Meet the Acorn Shell! Update! The Acorn Shell's code isn't going to be changed from the Blue Shell, which we all know the Blue Shell's ability is absolutely annoying. Fear not! I found a way to make this ability fun, Similiar to Newer's Minecart stages. There will only be 3 levels of this. 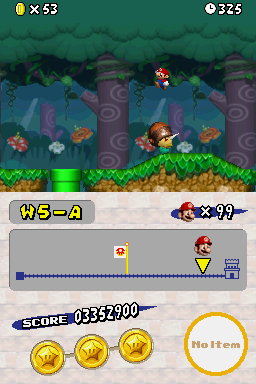 You start the level with any power up, but you MUST have the shell to continue, which a question box provides. 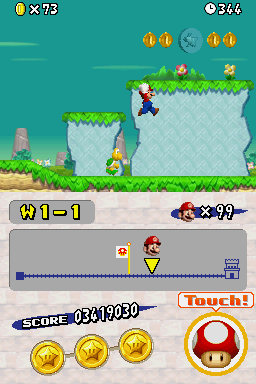 Once you continue, you warp down a hole and groundpound onto a slope in a different area, making you slide in the shell. It's an obstacle course, and you must have quick thinking. 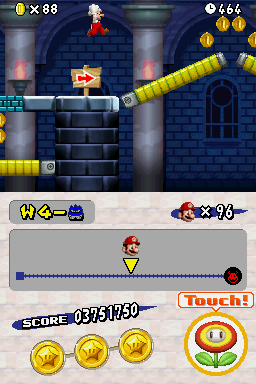 There's a midway point too, with 3 star coins. I also made it to where you MUST still have the acorn shell at the end before the flagpole, or else you can't complete the level. 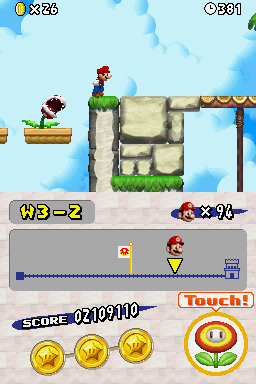 I completely made up this gimmick while playing the minecart stages and the starman stage from Newer. Anyway, we'll see how it turns out. 5-C, 4-A, and 4-Ghost house are finished. Update! 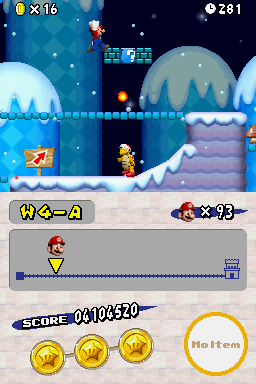 World 4 Castle and 6-1 are done! 6-1 took forever because of tileset errors that are finally corrected. Even then, it's boring. No bushes or mushrooms, or the mud walls. That will change soon!